Shampoo and Lotion: Best to Worst was created because sometimes I don’t feel like making my own stuff, or I don’t have the time, or someone in my family wants something different. I would like to be able to grab something at a local store and feel like I’m making an OK choice. But I definitely can’t rely on labels. This day everything is “All Natural”, though how that is defined is shockingly loose. I went into Walmart and made a list of their shampoos and lotions (though I can’t imagine using any other lotion than my homemade now). I listed the brands in order of toxicity, from the least to the worst. Most brands have some products that are better than others. This made the listing very difficult. Thus, I listed them according to the average number. Skin Deep is not the be all and end all to information, but it does a really good job ranking products based on ingredients. Aroma does play a strong role in their ranking, (Most man-made aromas are toxic which is why I have been baffled to find that many people are fine with adding Fragrance oils to their natural recipes. It sort of defeats the purpose.) as well as other ingredients that are known carcinogens, or ingredients where not enough information is known about them. Summary: The lowest toxicity number for all shampoos below, except Finesse, is 4! I was really wanting lower. Finesse had a product ranked at 3, yet the brand had the largest range with one product as high as 7. Other than the extremes, they are not that different from one another. 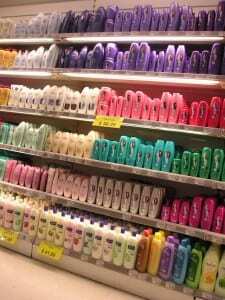 If you want to grab a product and don’t want to accidentally grab one with high toxicity, you’re likely to get a product with a ranking of 4 and no higher if you go for Aveeno, Herbal Essence, or Pert. Sometimes it helps if you find one with no fragrances (hypoallergenic or fragrance free) and stay away from any with sun block. The only way you really know is if you do your homework ahead of time, make your own, or know the meaning of all the terms on the back of the bottle. *note: the below information includes shampoo+conditioner products if available. 2) Pert – 4 products ranking 4 (Average 4). Summary: The top 6 brands have a choice ranking only 2! Much better choice than the shampoos. If you like one of those brands, find that product and see if it works for you. You really need to stay away from Dial and Gold Bond lotions! 1) Aveeno -15 products ranking 2-9 (Average 2-3). Mostly 2s and 3s with the one 9. Worst Product ranking 9: Aveeno Active Naturals Positively Radiant Tinted Moisturizer, Medium Sheer Tint – SPF product driving ranking up. 6) Lubriderm – 13 ranking 2-8 (Average 5). 7) Nivea – 23 ranking 3-8 (Average 5). ***Your brand may be listed, but your individual product is no longer seen as new (older products are moved to a different location and not included in this data). 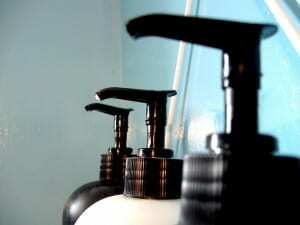 It still remains, the best idea…make your own Lotion and Shampoo! I really appreciate this information. Thank you for posting it. That’s really disturbing… like you, I would have hoped for some better ratings than that. Thanks for the eye-opening information! A few of these at either end of the spectrum surprised me — thanks for looking all this up and posting it — very eye-opening. You’re welcome. I really needed to do it for myself, and I was surprised at some as well. I always emailed this web site post page to all my contacts, because if like to read it afterward my friends will too. Thank you for this very helpful info!